This weekend the Stitches convention hit town. 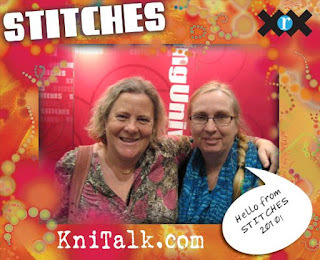 3000 knitter, crocheters and spinners along with 100s of vendors of all things fiber related. I went with Kerstin and we managed a full six hours in the market. I think having company gave me more energy - last year I packed it in at 2pm as I was so tired. It was a lot of fun going with Kerstin and although we did quite a bit of shopping - we didn't go crazy. I don't have pictures of my shopping, but it was a mix of yarn and spinning fibre which will no doubt surface over the coming months. Welcome Home - week 25! Our house is more-or-less finished and we are waiting for the town's final inspection before we consider it completely done. Also - before we remove the stickers from the windows which apparently have to stay there until inspection (!). Well, that's my excuse for not washing the rather dusty windows yet. Now for a load of photos for my family - if you are not as interested in the details as my family pass by the rest of this post! At the weekend we hung some of our pictures which really made it seem like home. We also entertained some friends and were pleased that the layout really worked well. So here are some photos of the new living room. 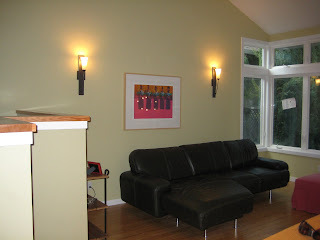 Photo above taken from kitchen over breakfast bar showing our terrific $250 craigslist sofa. 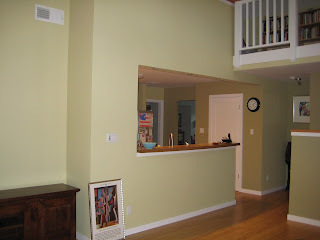 Pic below taken from the sofa back towards the kitchen. The white door is the pantry. The furniture on the bottom left is for the TV, when we get one. 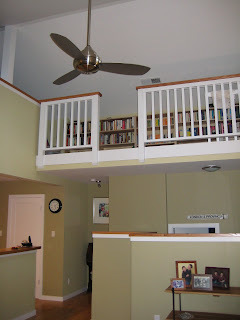 Photo below taken from living room looking up towards mezzanine and all our bookcases. 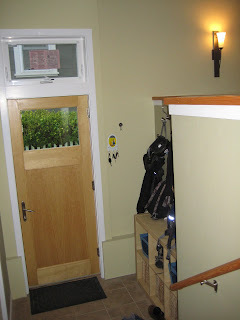 The half-wall on the bottom right of the photo conceals the mud room/back door and the door to the laundry room/bathroom. The last photo towards the new back door with our hooks and shoe storage on the right (and the laundry room unseen on the left). We are so pleased and still don't really feel as if it's our house (It's like staying in some fancy rental rather than a house that is actually ours...). And it's so nice not to have workers in every day - it seems really quiet here these days. 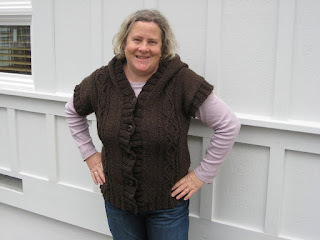 The pattern is from the Fall 2009 issue of Knitscene (which is aimed at a much younger demographic apparently). The yarn is Sweet Grass Wool Targee 2-ply. It's more like an Aran weight and feels really like handspun yarn (not my handspun of course). 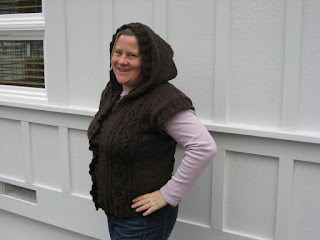 I bought 5 skeins at Stitches West last year with a view to knitting a cabled vest - and this hoodie exactly fitted what I had imagined. Dark wooden buttons from Yarndogs. 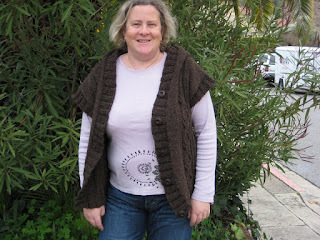 The button band is a bit loose in these photos - I need to give it another wash/blocking - but have not yet managed to take it off. This was definitely a 'win' project: nice to knit; with enough cables to keep it interesting; but a large gauge to make it quick; and a good finished product. 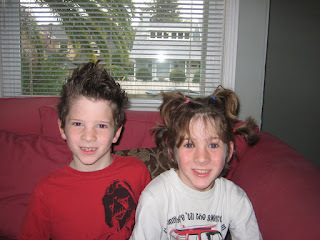 His coiffure apparently attracted a lot of compliments.... but that's 9-year-old boys for you! Once it's tidy I can take some final photos and show off the results of all these weeks of work. Now, if you will excuse me, I need to go unpack some boxes. 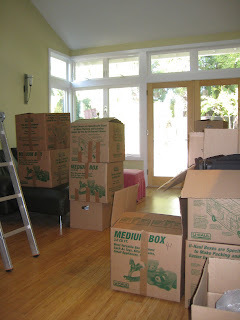 * It's remarkable how storing things for 6 months focuses the mind on how much you want the item back in the house! 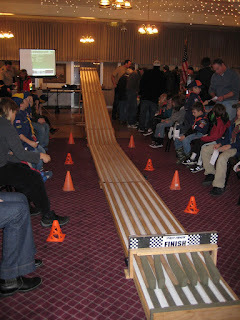 January means the annual scout Pinewood Derby. This is a race of cars that the boys have made themselves. The competition is state-wide (for all I know it's national) and to ensure that the playing field is somewhat level the cars need to be made from the same kits. These kits consist of a block of wood (pine I assume) 4 wheels and nail axles. 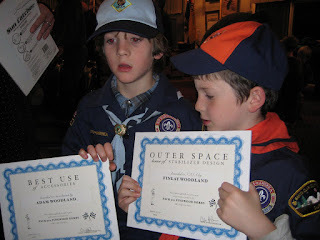 Notice how all the scouts are sitting neatly behind the cones? That lasted until the first race started and then became a scrum around the finish line! 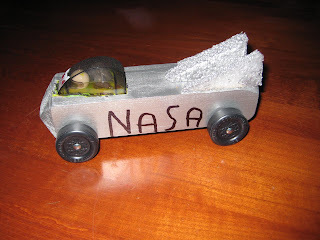 The cubs get a month or so to make their cars and we started over the Christmas holidays. There are prizes for speed, style, craftsmanship and originality - Adam and Fin decided to go for style over speed and both had clear ideas of what their cars should look like. Adam decided on a snowboard theme. He cut his block in half lengthwise and shaped and sanded it. He painted it and used stencils to make the decorations (there are more decorations on the bottom...just like a real snowboard). 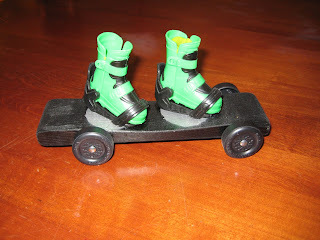 He drilled holes to mount the Action Man boots and then added lead fishing weights in the boots to bring it up to the maximum allowed (about 5 oz). Finlay decided to reproduce the space shuttle. He did minimal shaping of the wood and added styrofoam fins. The fins have to point upwards to meet the width limits. He sprayed the whole thing with silver paint and added a lego pilot. Less weight was added as he took little of the wood block off. He added his decoration with a sharpie. They were both delighted and already planning their cars for 2011!